Several comic books were released during both the Bat Masterson and Burke's Law series. Nan has 5 original comic books, in mint condition. 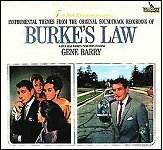 This record album, released sometime in the 1960's, was comprised of instrumental themes from Burke's Law. At least two 45-rpm records were released. 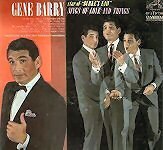 This record album, released in 1964 on the RCA label, is in the Library of Congress and is considered a collector's item. It was on radio station WHN in New York that he broke into show business. He has been a band vocalist and performed in night clubs. At least three Burke's Law novels were written by Roger Fuller. The novel on the left, published by Fontana Books, is a British edition. Nan owns "Madcap Millicent" and "Who Killed Beau Sparrow," published in the United States, both shown on the right. A Bat Masterson novel, an authorized edition based on the television series, was published by the Whitman Publishing Company (Racine, Wisconsin) in 1960. The novel was written by Wayne C. Lee and illustrated by Adam Szwejkowski. The Bat Masterson tv series was based on a 182-page paperback written by Richard O'Connor, published by DoubleDay Books in August 1957. It was reprinted by Bantam Books in November 1958 to promote the series. Posters from The War of the Worlds are a collector's item. Additional War of the World posters are here. Mr. Barry wrote to Glenda in 1986. The original cast recording of La Cage aux folles was released on tape and cd in 1983. You can listen to a short MIDI rendition of "We Are What We Are" by clicking on the speaker. A Burke's Law board game called "The Game of Who Killed?" was created in 1963 by Transogram when the original series aired on ABC-TV. This is a very scarce item (Glenda owns one).